Aviation Updates Philippines - Philippine Airlines is pleased to be part of the U.S. Transportation Security Administration (TSA) Pre✓®, an expedited security screening program which aims to help travelers enjoy a quick, convenient, hassle – free travel flying out of airports from and within the United States. TSA PRE-CHECK. PAL is now part of TSA pre-check program which aims to provide passengers with a more convenient security checking process across the United States. Photo by Seaborne Airlines. Passengers already enrolled in TSA Pre✓® only need to provide their Known Traveler Number (KTN) upon booking their flight. The name, date of birth and gender submitted for the airline reservation must be an exact match to their TSA Pre✓® application. Members of other Trusted Traveler Programs such as Global Entry, SENTRI and NEXUS are, likewise, eligible for TSA Pre✓®. Their members need to provide their 9-digit PASS ID when booking their PAL flight. Following these guidelines will help ensure passengers are considered for TSA Pre✓® when appropriate. 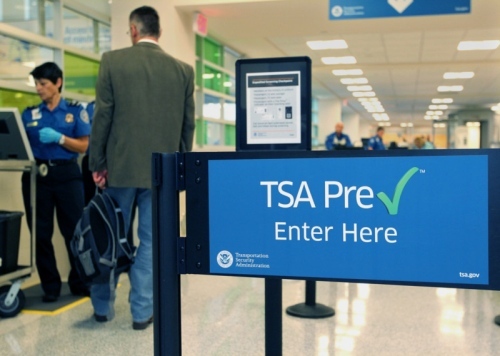 A TSA Pre✓® indicator will appear in your boarding pass if you are eligible for TSA Pre✓® on that flight. In addition to the indicator, TSA Pre✓® eligibility is embedded in the barcode of the boarding pass. The passenger then proceeds to the TSA security screening check-point at participating US airports and shows their boarding pass for scanning. Eligible passengers are directed to a dedicated TSA Pre✓® lane where Travelers are spared the inconvenience of having to remove their shoes, light outwear/jackets and belts, 3-1-1 Liquids Aerosols Gels (LAGs) compliant bag and laptop from their bag. The TSA Pre✓® application program membership is only open to U.S. citizens, U.S. nationals and lawful permanent residents. It takes five minutes to submit an online application and schedule an in-person appointment that includes a background check and fingerprinting at an enrollment center. Upon the successful completion of a background check, travelers will receive TSA Pre✓® eligibility for 5 years. TSA Pre✓® does not guarantee an individual expedited screening. TSA will always incorporate random and unpredictable security measures throughout the airport. Interested parties may log on www.tsa.gov/tsaprecheck to find out how to enroll in the TSA Pre✓®, including participating airports, security lanes and location of enrollment centers.